Fresh Baked: HAPPY NEW YEAR! 5… 4… 3… 2… 1… HAPPY NEW YEAR! Can you believe it? It’s 2013!! 2012 was filled with ups and downs, a few bumps and bruises, but plenty of good friends and love. At least it was here at Gingerscraps. Gingerscraps saw a new look, lots of new designers joining the team, and the sadness of a few leaving us. New Year’s is the time for celebration, and for reflecting. It’s the time to set new resolutions and review the ones we made the year prior. 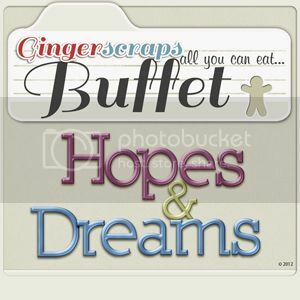 This month’s buffet, Hopes and Dreams is perfect for that! Okay, first, let me freak out a little. I mean, seriously. It’s JANUARY. It’s TWENTY-THIRTEEN! Oh Wow. December, you were really in for a treat! Several designers teamed up, and they all worked together to make a BEAUTIFUL kit! January’s Daily Download is just as awesome! I promise! Connie Prince, of Connie Prince Designs, is the designer this month, and considering the snow I see outside my window, and the snow that I hear has hit so many other places, PERFECT for January! Make sure you come back every day!